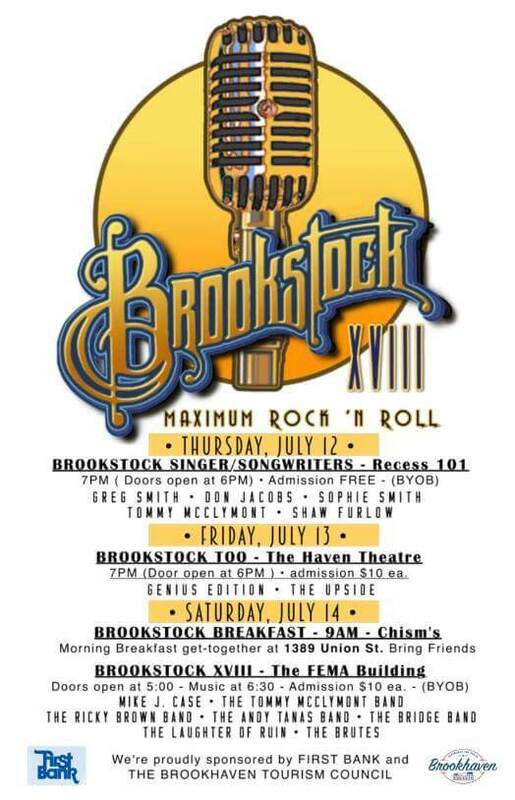 This year the event — Brookstock XVIII — begins Thursday, July 12, and rolls through Saturday, July 14, with music abundant throughout. The once-isolated event of just one concert playing for a high school reunion has blossomed into a three-night festival for anyone and everyone wanting to attend. Organizers want to showcase existing bands that have played with them for years, but also ignite interest in new, younger musicians. Thursday night the festival begins with the Singer/Songwriter Night at Recess 101 downtown near the Lincoln County Government Complex. Doors open at 6 p.m. and admission is free. Then, Friday night is called Brookstock Too, and helps open the doors of the Haven Theatre to hopefully a younger audience and growing musicians. Doors open at 6 p.m with music beginning at 7 p.m. and admission is $10. Saturday morning offers a Brookstock Breakfast Club at Chism’s Diner on Union Street Extension (Dutch treat breakfast). Later in the evening Brookstock XVII kicks off at the Brookhaven Building on Industrial Park Road. Doors open at 5 p.m. with music starting at 7 p.m. and admission is $10. We hope that you join us for a weekend full of talent in Brookhaven!